Banshee is an open-source media player, called Sonance until 2005.Built upon Mono and Gtk#, it uses the GStreamer multimedia platform for encoding and decoding various media formats, including Ogg Vorbis, MP3 and FLAC. 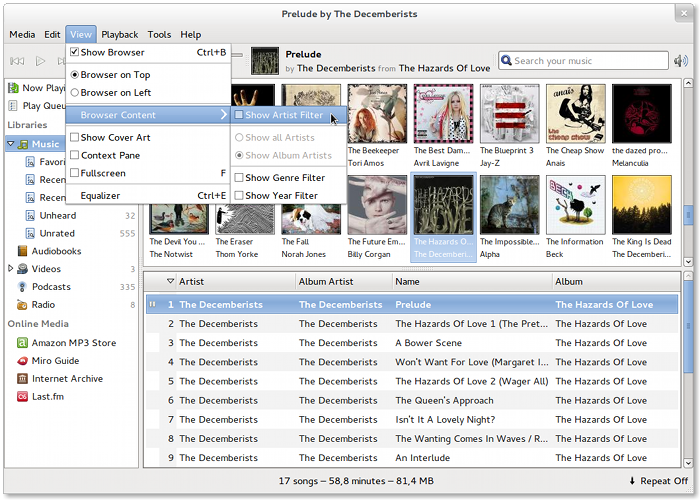 Banshee can play and import audio CDs and supports many portable media players, including Apple’s iPod, Android devices and Creative’s ZEN players.Other features include Last.fm integration, album artwork fetching, smart playlists and podcast support. Banshee is released under the terms of the MIT License. Stable versions are available for many Linux distributions, as well as a beta preview for Mac OS X and an alpha preview for Windows. Watch your DVDs with Banshee. You can navigate in the DVD's menus using the mouse or the keyboard. You can now display the genres and years in the browser, in addition to the artists and the albums, and use them to filter your music library. The artist filter can be hidden, or it can be set to only display album artists, instead of all artists in your library. Browse and play music or videos shared over your local network via a UPnP device. Dap.MassStorage: metadata resync in manual mode. Mpris: Add xesam:userRating field in track metadata. bgo#648522: Fix race condition when starting multiple instances. bgo#667355: SourceWatcher: Fix SQL error caused by incorrect escaping. bgo#667478: Fix build with libmtp 1.1.